You can download Pretty Good Solitaire version 18.0 from http://www.goodsol.com/download.html . Or, if you have a previous version installed, you can run the game, go to the Internet menu, and select "Download Latest Version". Be sure to exit the game before you install. If you registration code begins with "46", "48", "2d", "2a", or "2e", version 18.0 is a free update. Otherwise, it is not. Pretty Good Solitaire version 18.0 is a free update for those who originally ordered version 16 (ordered after February 2, 2016) or those who paid for an upgrade during that time. However, it is not a free upgrade for those who originally ordered version 15 or earlier (ordered before February 2, 2016). Full details on upgrading are at http://www.goodsol.com/upgrade.html . Upgrades are still only US$11.95 and are vital to keep us going to make Pretty Good Solitaire better. Upgrading now gets free updates through the end of the 2022 version. 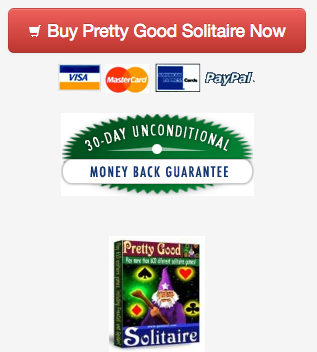 Pretty Good Solitaire version 18.0 is US$24.95 for immediate electronic delivery. If you want an additional CD, there is an option to add $9.95 shipping for a CD. In addition to installing the basic game, the CD also installs all of the currently available extra card sets. You can order online from http://www.goodsol.com/order.html using major credit cards or PayPal. In some countries, other payment options such as using your Amazon account, Sofort, GiroPay, and bank transfers are also available. Forty Thieves Type games - Battaillion Carre, Crown, Doorways, Left Side Story, Loopy, Lucky Eight, Magnum, Ninety-Nine, Old Moon, Orwell, Shining Star, Single Interchange Cell, Sixty Bandits, Stalemate. Mac users: The latest version of Pretty Good Solitaire for Mac is version 3.4 with 700 games. If you have not yet updated to version 3.4, we highly recommend you do so by going to the Internet menu in the game, select "Download Latest Version". Do this before updating to macOS High Sierra as versions 1 or 2 of Pretty Good Solitaire Mac Edition will not run in High Sierra. If you have already updated to High Sierra and are not yet using version 3, you will need to download again from the link in your receipt email. 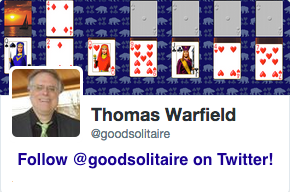 A new version of Pretty Good Solitaire Mac Edition will be coming later in the spring or summer.